Wow, the silly season has really lived up to its name this year. So many dinner invites, Christmas shopping, BBQs, elderflower fizz cocktails, a wedding, driving ten hours to reach my family’s place in Kaiteriteri, Motueka. One hardly has time to think, let alone bake the annual Chrissie Cake. If you’re like me and you love to leave things to the very last minute, this Christmas cake is a winner. I mean, look at how late I’m posting this and you’ll still have time to shop for the fruit, have a big pot of tea and cake at your favourite café, soak the fruit overnight, cook the cake and wrap all your pressies whilst drinking a sherry! Last year I whipped this cake up on Christmas Day whilst entertaining a crowd of twenty and it went down a treat. 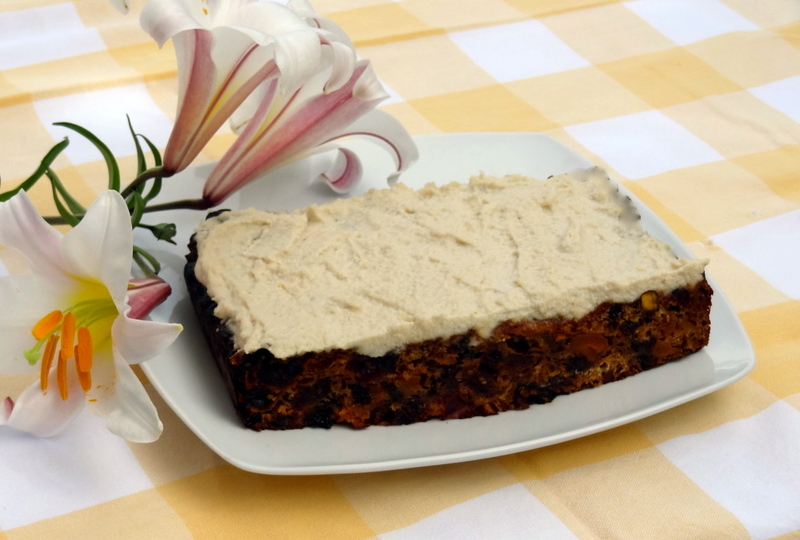 A lovely lady called Ellie Henderson gave me this fruit cake recipe when I was a wee lass, out on a neighbourhood stroll in Kaiteriteri one day. I popped in and proceeded to devour a good portion of the Christmas cake the good host had offered me. To avoid a repeat, she kindly handed me the recipe. I couldn’t believe that this fruitcake that tasted so damn good had no fat or refined sugar. I’ve tweaked the original recipe by adding a decadent twist of creamy cashew icing. The creamy icing is made up of cashews, which you can read how amazing they are in my recipe for Dreamy Lemon and Blueberry “Cheeseake” . The high content of dried fruit offers a generous dose of fibre, which will assist in cleansing the system after all the indulgent Christmas goodies. As this cake does not contain lard (eeek!) or mounds of sugar like a traditional Christmas cake, you’ll be able to eat a good portion and not feel like a nap afterwards, as your blood sugars should remain consistent. Until the Champagne Breakfast. In a bowl, soak the cashews overnight in water. In another large bowl, soak the dried fruit in the orange juice, tea, or a mixture of the two. Add the mixed spice and cinnamon and stir well. Leave overnight in the refrigerator and give a stir every so often. Heat the oven to 150°c. Line a large cake tin with baking paper. Add the self-raising flour and mix well. Spread the mixture into the lined tin and pop into the oven for 2 hours. In a blender, combine all of the icing ingredients (apart from the water) and mix well. Add water as needed to reach the desired smooth consistency. Ice the cake and eat!